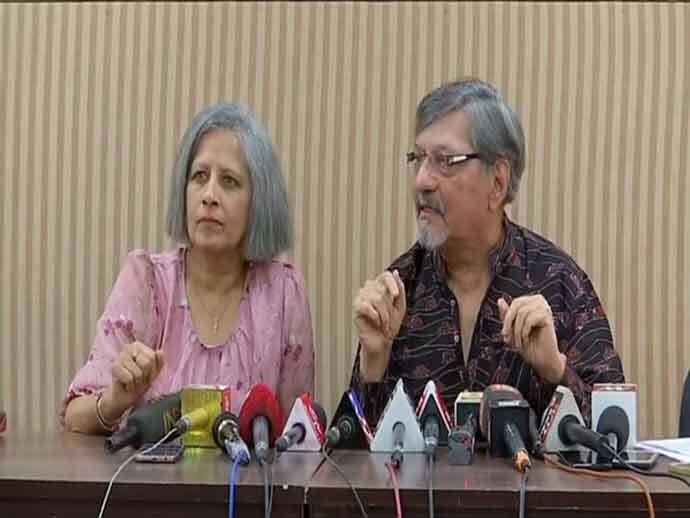 This isn't just about how actor Amol Palekar felt when he was interrupted at an art opening in Mumbai at the NGMA, when he criticised the Ministry of Culture reportedly scrapping the advisory committees at its centres in Mumbai and Bengaluru. This is about how quick we are to jump to conclusions for the sake of sensationalism, quick to take sides, racing to fasten ourselves to what is considered the moral side of the story. Within hours, the incident hit the headlines and protests galvanised over social media. Artists and curators became vocal about their artistic freedom and issues with censorship once again. They denounced what appeared to them as an attempt to interrupt the actor as he criticised the culture ministry. To my mind, ther are quite quick to jump onto the bandwagon of revolution if it is the other who has started it, but are careful to show support mainly from the periphery. As a reporter I am also confused about this very vocal protest by artists, many of whom have said in interviews how they don't want their work to be called either 'feminist' or even be categorised as 'political art'. Like their press notes or concept notes or curatorial notes, this disengagement from politics is articulated in abstractionist language, which, to me, is quite absurdist. (Not that I am denouncing absurdism. We do exist in a chaotic universe). Palekar is among the few who have dared to speak against policy changes in the cultural space that might affect the cause of art in the country. He spoke about how happy he was when he got to know about the plan to open NGMA branches in Kolkata and the North East but how, in 2018, he was shocked to know that the NGMA advisory committee had been dissolved. Now, the curator, Jesal Thacker, who met Palekar several times to discuss what the actor had to say about Barwe, whom he had had known (in fact the artist had mentioned once how Palekar had influenced his work) says she interrupted Palekar at the event because she had wanted the focus of the event to be on Barwe, whose retrospective was taking place after 24 years. She had been excited about the anecdotes that Palekar had shared and says she wanted Palekar to share those with the audience. Thacker, who has worked for a long time researching the works of the artist and put together a retrospective for him titled 'Inside the Empty Box', asked Palekar to keep his speech focused on Barwe, a request which has now snowballed into a controversy where many are accusing her of not protecting and supporting her speaker, and in fact interrupting him several times. "I stand for art and artists and I wasn't opposing Palekar but only requested the focus of the evening be Barwe. As Barwe too is a local artist being celebrated after 24 years," she says. Barwe, an idealist, was all about guarding individuality and freedom of an artist. 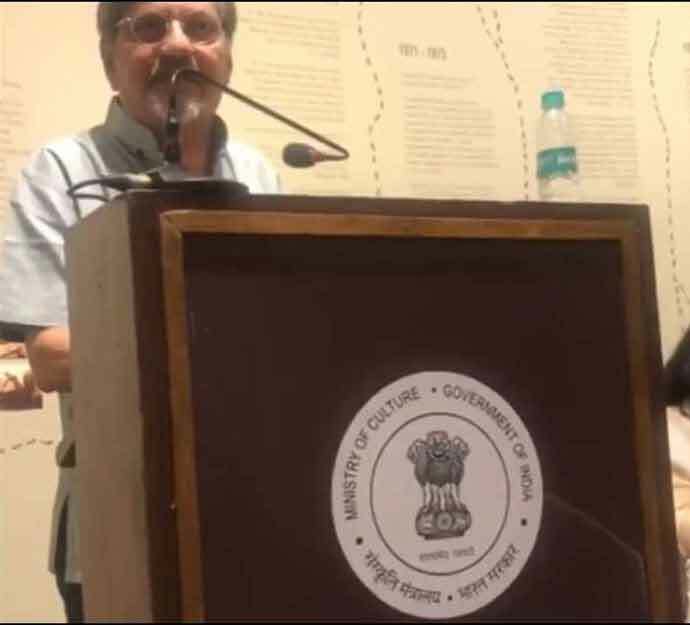 "My purpose of inviting Amol Palekar as one of the guest speakers for the inauguration of Prabhakar Barwe's retrospective was because of his association and admiration of the artist. As much as I admire both Barwe and Amol, my intention was not to prevent Amol from finishing his speech, but instead, I only requested him to share more about his anecdotes and fond memories of the artist who was being celebrated so long after his demise," Thacker says. But Palekar's speech, that criticised the NGMA's decision to cancel the two retrospectives after Barwe, was also about the artist in a way that looked at how local artists must be celebrated and not shunned. Thacker, who is not part of the NGMA, had been researching Barwe's art since 1998, while she was still a student at the Sir JJ School of Art, Mumbai. In her opinion, "Barwe wrote extensively about poetry (in fact he even wrote poems and short stories of his own), and he mentions Amol Palekar, his plays and how these modes of expression ultimately fed into his own ideology and method of creating art. Can one understand painting through the compositional lens of theatre? I sought to understand these cross-disciplinary conversations and how they manifest through this conversation with Amol Palekar, as he was a part of that atmosphere back then," she says. In the excerpts from her interview with Palekar, Thacker says he told her he had met Barwe in 1973, although the artist had been his senior at the JJ School of Art. "I remember meeting Barwe when he was in "Samovad" when he used to regularly meet all these youngsters, Dilip Ranade, Madhav Imartey, Shakuntala Paranjpe, Aparna Mehra. All these people, they used to meet regularly and there used to be lot of interaction... I was an outsider but what I remember is the warmth with which he would talk to these youngsters and make them completely at ease. He was already almost an icon by that time," she quoted from the interviews. Palekar told Thacker during their interaction that Barwe was different and he could relate his work to the kind of theatre he was trying to do at that time. "We both were moving away from naturalistic or realistic depiction. I was then trying to explore other idioms like surrealism. So, in a very different way I could relate to Barwe and probably, Barwe could relate to my theatre. That is why he could come and see my shows too," Palekar had told her. For the curator, it was all these stories that she had wanted Palekar to share with the audience. As part of the panel, she was trying to keep the conversation limited to Barwe. Palekar has said he felt hurt and Thacker has said she was misunderstood. And within a day, social media has exploded with people slamming the panel and the curator for the interruption, including many artists and people related to the art world who have themselves refrained from saying anything that might be slightly controversial and might land them in trouble with the government. A famous artist in fact recently asked me not to mention the title of the project that was also the name of a goddess, so she doesn't get into trouble with the nationalists because of the political references in her work. Another contemporary artist told me how in India, nobody makes any political art because it is 'dangerous'. Yet, the art landscape in India is now witnessing a revolution with artists belonging to lower castes or trying to highlight labour and other issues pertaining to class and caste. These artists, who are radical and state their works are political, say it is difficult for them to get gallery representation in elite art spaces. A slew of alternative spaces are the only ones promoting such art. So the limited point I make is that the Amol Palekar-NGMA episode should not just be an incident where an interruption happens and all start to denounce everything, but in fact, a cause for the art community to reflect on its own reluctance and fear of the state and not be shy of starting their own revolutions rather than just joining the herd. Palekar has raised an important issue and rather than making it about the interruptions, the art community should fight along with Palekar for the cause of art, rather than indulging in blame games. A revolution needs soldiers, not commentators.